The rain stopped as we prepared to go to the Pictured Rocks Visitor's Center to pick up our backcountry permit. Things were looking up! We got there just after 9 am, and as one park service employee asked us questions and filled out the permit, another one leaned over to issue a warning. “Wear a bug net and bring bug spray,” she said. “The mosquitoes are horrible.” I think she actually shuddered a little. Mushrooms on a log. Chapel Falls Trail. I was wearing a long-sleeved shirt and long pants, and I had treated my clothes with permethrin the previous morning. This would be my first time trying permethrin, and I was anxious to see how well it worked. Andrea decided not to treat her clothes so that we could run a controlled experiment to test its effectiveness. I hadn't been on a trip in several years where I'd needed deet, so I picked up a small bottle of Ben's 100 for this trip, which works well. We headed east on H-58, turning north on Chapel Road at Melstrand. Chapel Road is unpaved, and the recent rain had reconstructed the dirt road into a network of mud-filled ruts. At the Chapel / Mosquito trailhead, a notice warns visitors that some of the sandstone cliffs can reach 200 feet above Lake Superior and that the edges are unstable due to erosion and undercutting. A newly-installed boot brush encourages hikers to clean their boots before and after hiking to deter the transmission of invasive seeds. We began the short, 3.3-mile hike to Chapel Beach campground via Chapel Falls Trail at 10:00 am. The weather was sunny and warm, and there was no longer any sign of rain. Weather is unpredictable in this area, however, and we were aware that this could change at any moment. We enjoyed an easy, pleasant hike to Chapel Beach, stopping often to photograph things along the way. The path from the trailhead to Chapel is entirely in the woods; there are no cliff views during this stretch, but the forest displayed a lot of new growth, and made for an interesting walk. The trail skirts Chapel Falls, which is a pretty, 60-foot cascade down the side of a bluff that is partially obscured by trees and difficult to photograph. The path crosses Chapel Creek via a foot bridge upstream from the falls and provides views from near the top of the waterfall and from a viewing platform across the gorge. Starting out in short sleeves, it wasn't long before Andrea stopped to put on a long-sleeved shirt in an effort to thwart mosquitoes. The permethrin appeared to be working; scientific observation of each other's pant legs revealed far fewer mosquitoes landing on mine and staying there than on Andrea's. We arrived at Chapel Beach campground just before noon and had to put our bug nets on as soon as we got there. The campground consists of six sites, which are in the woods at the top of a bluff above Lake Superior. One of them (#6) is at the edge of the woods, and it is close enough to the beach to benefit from the breeze coming from the lake. This site was already occupied, of course, so we chose site #3, which was further into the woods. Under normal circumstances, this would be a really good campsite, with Chapel Creek running alongside it creating a nice atmosphere. Unfortunately, the exceptionally wet spring had ensured that this typically buggy season far exceeded expectations. The word “brutal” doesn't quite do it justice – it was a buzzing hellscape. The only thing to do was to set up camp as quickly as possible and flee to the beach. The tent was up in seconds, and we immediately began blowing up our sleeping pads. (Why did we pick this trip to test new, non-self-inflating mattresses?) I wheezed into mine as quickly as possible with the nozzle under my bug net – a piece of equipment I could not have been more grateful to own. Andrea took a picture of me during this time, which unfortunately turned out blurry, probably due to her hands being jostled around by thousands of attacking mosquitoes. Needless to say, the photograph is disturbing. I look like a demonic beekeeper. At one point, I turned around to get something from my pack, which I had leaned against a log, and found it engulfed in mosquitoes. They were everywhere - landing on the outside of the pack in droves, and crawling around inside of it like a sentient, rippling membrane seeking anything with a pulse. One of us threw everything in the tent that needed to go in there, while the other stood guard, waving her arms around the tent door in a feeble attempt to stop the insect influx. I don't remember which of us did what; it's all a blur. We grabbed the food and cooking supplies and ran for it. After descending the bluff to collect water from the lake, we climbed back up to a flat, sandy area to filter the water and cook ramen noodles for lunch. The thought of going back into the woods to gather twigs for the Emberlit stove was not appealing, so we used the Jetboil and decided to hold off on field testing the twig burner for the time-being. returned to the beach and walked to the spot where Chapel Creek flows into the lake just west of Chapel Rock. A new development since we were here last, a sign now asks people not to approach the rock formation and requires them to stay back a certain distance in order to slow erosion and help preserve the sandstone landmark. We watched the occasional Pictured Rocks Cruise boat approach Chapel Rock at the end of its journey and turn around to return to Munising. In a perfect demonstration of the unpredictability of the weather near Lake Superior, at 3:00 pm it was sunny without a hint of change brewing. By 3:15, fog had rolled in, and we were engulfed in mist. The tour boats vanished from sight, and we could hear them blowing their horns out in the fog to alert other boats of their presence. The sun burned the fog away, but another wave of it rolled in directly afterwards. We decided to hike east along the trail, past Chapel Rock and out to Spray Falls, which is about a mile and a half away. Spray Falls drops 70 feet off a cliff into Lake Superior and can be seen from the top of another cliff that acts as a natural viewing platform a little further east of the waterfall. 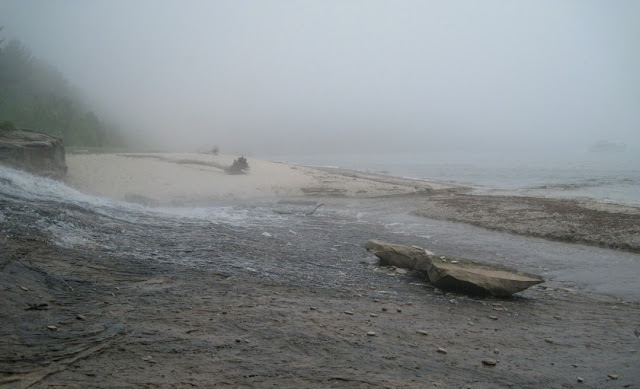 The fog continued to roll in, burn away, and roll in again as we returned to Chapel Beach. We made dinner on the beach in order to continue avoiding mosquitoes. It was a shame that the campsite wasn't used, but on the other hand, the beach was an even better spot to spend our time. Periodically, we heard a booming sound that sounded like the rumble of distant thunder, but it was actually the sound of waves echoing inside a series of narrow, rocky coves just to the west called Battleship Row. We cooked Chilimac (Mary Jane's Farm Outpost) and watched the sky darken. It looked like it was going to storm, but the clouds blew over us and were replaced by a dark wall of fog that moved toward us from the lake. The occasional horn could still be heard from cruise boats that continued going back and forth along the circuit. We wondered why they were still out on the water and if the tourists on them could actually see anything. It would definitely be a unique and erie experience. The fog was cool for us to witness, but the kayaker who approached us and asked to look at our trail map was not very impressed. We watched as he and another kayaker beached their kayaks. They had camped at Little Beaver Lake and were paddling west toward Miner's Beach, but the fog had stranded them. Now that it looked like the fog was here to stay, they were making the decision to hike back to their camp. It was getting dark by this time, so it was unlikely to be a pleasant hike even without the mosquito situation. At the end of the day, I think I had just as many, if not more mosquito bites than Andrea, so the permethrin results are inconclusive, which is disappointing. The reason I don't consider it a failure is because I'm not sure that I can consider the conditions typical. We had eventually sprayed deet on our hands, which were the only things not covered by clothing or bug nets, but not before each of us had received several mosquito bites on our palms and fingers. I counted 6 on my left palm alone. We strategized a way to get back to our campsite and into the tent as quickly as possible, and we organized our gear on the beach, getting everything ready ahead of time that we might need, and climbing up and away from the water and back into the woods to clean up from dinner. Chapel Creek flows into Lake Superior. A boat hides in the fog. We stashed our food in the bear-proof locker on the way back to the tent and dove in. Without exaggeration, the buzzing of mosquitoes outside the tent was louder than the sound of Chapel Creek rippling by just a few feet away, which was slightly disturbing. Eventually the mosquitoes quieted down enough so that we could enjoy the sound of the stream and the lake's surf. I attempted to read for a little while, but fell asleep quickly, dreaming that a bad storm blew in and park rangers were walking around in the dark, securing everyone's tents with extra stakes to keep people from blowing away. Great pictures considering the weather! Your stories about the mosquitoes were very funny(to those of us reading them). I just read about a guy hiking the North Country Trail from west to east. He said the mosquitoes were so bad in the UP that one night he slept in an outhouse! Thanks for your comments. I will have Day 2 posted soon. Regarding the guy hiking the NCT - I want to read that! I'm hoping that he was using creative embellishment and that he didn't really sleep in an outhouse. Ugh. These are great. I grew up in the UP and miss it all the time, especially considering where I am currently working.